BowFlex BXE 216 Elliptical Review by Industry Experts! Bowflex is best known for their innovative and very popular Treadclimbers and Max Trainers. Both of these machines work to provide a high calorie burning workout will less time and effort on your part. We were excited to hear that Bowflex released a line of ellipticals and quickly arranged to interview Bowflex representives. During our conversation, they explained what sets Bowflex apart from the other brands. This is an award-winning company that has a strong and positive company culture. It is clear to us that they are doing everything in their power to offer their customers some of the best products on the market. Mid Week Sale Ends Thursday: Use the Promo Code on the Bowflex Website to Save Use Code “TAX2019” for Free Shipping! Bluetooth Compatible – For years, Bowflex lagged behind the competition because they did not have fitness tracking on their machines. That has all changed now that they have Bluetooth compatibility and a free Results Series app. This system lets you track your workouts and make better progress towards you goals! Switch Select Cushioning – You can adjust the pedals to activate more leg muscles and create a more comfortable workout. 11 Pre-Programmed Workouts – A good selection of programs to keep you motivated and interested. Burn Rate Console – The display on the BXE 216 is a 9″ LCD Color display with a burn rate console. 22″ Stride Length – We like that the stride length will work well for taller individuals. Many other brands have shorter and choppier stride lengths. 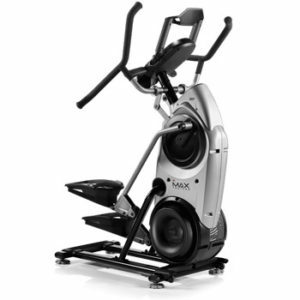 35 lb Flywheel – Bowflex ellipticals can compete with the very best with this very heavy flywheel. This will contribute a smooth and natural feeling elliptical motion. Warranty – The BXE 216 comes with a 15 yr Frame, 5 year parts and electronics, and 2 year labor warranty. It’s the not the strongest warranty we’ve ever seen for a machine in this price range. Many other brands offer a lifetime warranty on the frame. 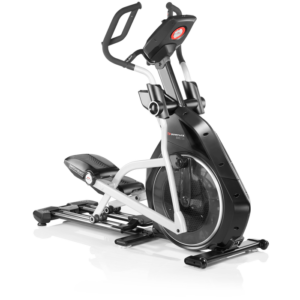 The Bowflex BXE 216 is the top elliptical model offered from Bowflex. 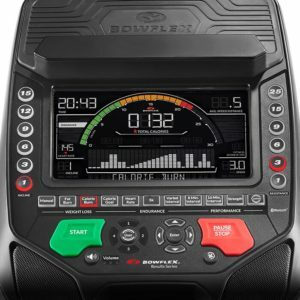 You may also want to check out the Bowflex BXE 116 to save around $300. Overall, it’s a quality machine from a very strong company. We don’t feel that the innovation is quite as strong on the elliptical line as it is on the Treadclimber and Max Trainer lines. Still, if you are already a fan of Bowflex, then the BXE 216 is a great option.